Mr James Oh (see below) hit the nail on the head when he pointed out why many Singaporeans feel indignant about scouting for these sports talents to win medals for Singapore using huge tax payers’ money, which I won’t repeat here. Picture credit: Bernard TanA reader by the name of Bernard Tan wanted me to publish this captioned photo produced by him which may have summed up the feeling of a section of our citizens’ view on this “historical” win. As pointed out by James Oh, Singaporeans, by and large, do not treat foreign-born athletes who arrived under external circumstances, such as family reasons or marriages, and became citizens such as Mr Tan Howe Liang and we generally do not begrudge them their foreign roots. On the other hand, Ms Feng Tianwei and others in our table tennis team were scouted by the Singapore Table Tennis Association (STTA) and invited to play for us by giving them the citizenships one year after coming to Singapore, is clearly not right. While people like Tan Howe Liang has become one of us and still here at the age of 70, I bet many of these sports mercenaries are here for the attractive salaries and perks and will most likely return to China or some western countries once their sports or coaching career is over. The most damaging side effect of FTS is these foreign imports are depriving promising Singapore paddlers (where is the level playing field?) from representing our country by occupying, not one, not few, Source: The Straits Times 10 Aug12but entire representation without a single local born table tennis player to represent our own country. As if this is not enough, the entire team in the Men’s team are also imported from China now, many of them new faces which must have been recruited in the last two to three years. No matter what sugar coating STTA is trying to put up to brainwash the public, the truth of the matter is they have distorted the true intention of the Foreign Sports Talent (FTS) scheme, which is to leverage on these imports to raise the overall standard for our local players, NOT taking over all their places as is happening in the last ten years or more. STTA has failed Singapore misery and shamelessly indeed. The fault lies squarely with STTA and the Government, not the players themselves. No person with a sensible mind will turn down such attractive offers to play competitive sports, even at the expense of giving up his/her citizenship as long as (and I assume) “one’s conscience and love for the motherland is always with one’s heart” (see the cartoon below). In the same page of The Straits Times report dated 8 Aug 2012, Minister Chan Chun Seng was quoted: “for those who’ve joined us, we hope they can inspire a new generation of young athlete and that to us is the most important thing.” He also said that Singapore is not going to just rely on foreign-born athletes for glory. And the joke was on him that in the commentary by Terrence Voon just below his quote, the reporter revealed just who these next generation of young athletes are and you have guessed it, another generation of new imports: Liu Shiwen (22) and Sun Beibei (28). The reporter urged the STTA to groom local-born Isabelle Li (17) for the next Olympics. “We have a succession plan,” said the STTA chief Lee Bee Wah without revealing the details. If there was ever a plan, Askmelah has lost my trust in her and STTA, period. Askmelah do not believe that Singapore can not produce a true Olympics medal of our own, it is the lack of political will and the preference to take shortcut approach at the very top of the Government and the Sports authority. With the ten of millions spent on FTS, a fraction of that will have produced a Olympic champion by now if we have actively identified and groomed the right talents (see below “Our children need coaches like Bowman”) over the last 20 years. I leave you with a touching story of a young man from a tiny island nation of Grenada who have brought home the first gold medal in the history of his country in the 2012 Olympic. Grenada, a tiny country of less than 105,000 people who has never won an Olympics medal before. Singapore has 5 million people now and people of all kinds of ethnicity, state of the art training facilities and tons of monies and we can not produce even an Olympic medalist of our own? That’s not the Singapore spirit that we all know for sure. Feng Tianwei in focus: a price worth paying? [Updated 11Aug2012] In The Straits Times today titled “Less Govt, more people in sports“, Journalist Jeremy Au Yong commented that while Malaysia’s Lee Chong Wei win united the nation of all political parties and races, Feng’s win seems to have divided opinions in Singapore sharply. He then offers a refreshing perspective on the contrast: the involvement of the State and its political undertone. “Sports ambition in Singapore appear to be very much a Government-led (Askmelah: more precisely Politicians-led, Government officials need not have to be politicians.) initiative, with Government doing much of the heavy lifting.” With Sports associations tends to be headed by MPs (and other politicians), it may be best if the politicians should be less involved in Sports so that Sports can be used as a tool for uniting a nation instead of dividing the nation. In this debate on foreign-born athletes, the issue is not where they hailed from, how well they have integrated in our society or how much they wanted to win for Singapore. It is how they ended up representing our country or, specifically, the practice of scouting for foreign players. We have had foreign-born athletes who arrived under external circumstances, such as family reasons or studies, and became citizens. This includes Mr Tan Howe Liang and Mr Ronald Susilo. Globally, French football great Zinedine Zidane is an example. We should never begrudge them their foreign roots. On the other hand, Ms Feng Tianwei and others in our table tennis team were scouted by the Singapore Table Tennis Association (STTA) and invited to play for us. I question the motive for this. Was it to enrich and help develop the local scene? This is hardly convincing, with not a single local-born player in the team since the last Olympics. One could hardly fault those who view this as a shortcut to success. In our excitement and delight at winning medals, are we unwittingly encouraging our sports associations to seek further success through these means? While it is true that we are not the only country doing this, is it the right way? We do not want the scenario in European club football where scouts travel the world in search of young talent. It becomes an arms race of who can spot the next Michael Phelps and offer the biggest carrot. It may be valid for club football but is not in the Olympic spirit. Ms Feng unquestionably deserves the accolades for her hard work and dedication. To the average outside observer, Singapore might be perceived as a table tennis powerhouse that churns out world-class players year after year. This is obviously not the case. I take no issue with the paddlers themselves, and I congratulate them on their Olympic success. However, by importing established sportsmen and having them represent us on a world stage, we are telling the world that our country takes shortcuts and lives by the axiom “it doesn’t matter how it gets done, as long as it gets done”. The argument that Singapore is not the only one doing it is moot. It matters not if a sports talent is born locally or not. It matters that he or she established him or herself training here, barring overseas training stints. Mr Tan Howe Liang emigrated here with his family at age four and won the Olympic silver medal at 27. It takes years of hard work, thousands of hours of training, to be world class. With the current practice of importing sportsmen, the experience of producing a world-class athlete is lost. If the sportsmen were brought in to train up our budding local pool, it has yet to show fruition since the Rainbow Scheme (now the Foreign Sports Talent scheme) began in 1993. If they are here only to put Singapore on the medal tally board, then “mission accomplished”. However, I feel indifferent about the medals because this only shows that we did well in talent recruitment, not development. No disrespect to our medal-winning Olympians, but I cannot identify with the principle behind their achievements. Singapore needs sustainable plans and solutions for its future survival. The Foreign Sports Talent scheme is but one of many quick fixes commonplace in recent years. Other examples include increasing immigration rather than focusing on the causes of our declining birth rates, and reactively beefing up the number of healthcare professionals from overseas instead of planning earlier for the not so unforeseeable shortfall. Singapore started as a fishing village. It was by no means a shortcut that we got to where we are today. Singapore knew how to fish, but it seems now like we just buy the fish. I believe there is more to the Singapore spirit than this. 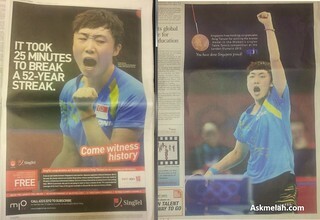 Criticise Feng Tianwei? But what makes a Singaporean? The above was written by a British journalist when the British sports councils were considering importing athletes to boost its medal winning hopes in the 2012 Olympics. She concluded that there was “no alternative to serious investments” in home grown sporting talents. We expect parents to spend money on coaching for their children and, only when they have become good enough to potentially win medals will they be allowed to join the schools’ sports club. Our systems (sports, education, labour) no longer nurture our citizens, we merely use them or shove them aside. To me, one man stood out at the Olympics: Coach Bob Bowman, who took swimmer Michael Phelps under his wing when the latter was only 11 years old, a child of recently divorced parents then, and has stood with him since. Mr Bowman nurtured him, believed in him and helped this child diagnosed with attention-deficit hyperactivity disorder to become the most decorated Olympian of all time. The coach was there to guide his swimmer in an authentic relationship, not just in swimming but also in life. This is how we, as parents or educators, should be to our children, or charges, for them to reach their potential. Even with any learning difficulties or upsets along the way, rather than give up, we should allow them to grow. It is never too late to do it. Mr Bowman did it for a pre-teen child who was not his own. We can do it, too. ‹ Succession planning: Missing the point?